Here's a last minute gift idea for yourself or someone else—just be warned that the thumping bass might annoy the neighbors if you live an apartment complex. It's the Klipsch Promedia 2.1 THX certified multimedia speaker set, and it's available for just $110. BuyDig has the speaker set listed for $160, but if you use coupon code JINGLEBELLS it will boot $50 off the price. Standard shipping is free too, which will see the speakers delivered in 2-5 business days. That means they won't arrive in time to wrap and place under the Christmas tree, but you could always print a picture and wrap that instead. 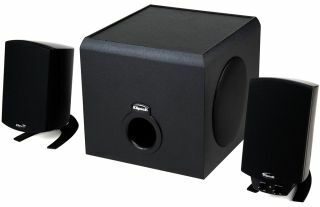 The Klipsch Promedia 2.1 is one of the more popular speaker sets out there. It's not quite audiophile quality, but the sound is very good for the price and the bass thumps hard enough to travel through walls. It's also worth noting that these are new speakers (read: not refurbished) and come with a one-year warranty.